Detroit was the city and Jazz was the game, so when Guitarist Mike Fageros, Organist Chris Codish and Drummer Ron Pangborn hooked up at the Cadieux Cafe on the East Side during Sunday night "Soul Sundays" jazz session, they decided to take it to the next level and record at the "White Room" to make it official. During one of the coldest days of March 2009, which would have been the third, with the temperature down around 18 degrees, they recorded the first session for the project Midnite Tippin' known herein as Volume I. 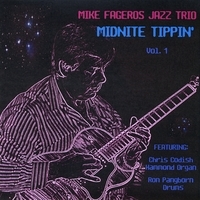 Enclosed in the grooves, you will find the warm sounds of their version of the Guitar,Organ,Drums Trio with great arrangements of standards by legendaries including Horace Silver, Pat Martino,Don Patterson, Wayne Shorter,Miles Davis, Joe Henderson and Kenny Barron along with the title track written by Mike Fageros entitled The Midnite Tipper'. Special thanks go out to Pat Martino, Oksana Neverkovich,John Smerek, Candice Byrd and Jeff Smith at Southwest Recording for help on the project. The title track The Midnite Tipper' is dedicated to Pat Martino.